Services designed for live coverage for News, Sports, Entertainment and Corporate events. Encryption Options: – BISS, RAS, and any other customer required encryption. Antenna Size: – 1.2 meter. – 1.8 meter. Satcom Media Broadcast Pvt. Ltd. Has developed both fixed and mobile DSNG solutions for satellite news gathering. These Vans are engineered within a house. These vans are available in various configurations in C Band and Ku Band with a variety of antenna options. The antenna options include fully automatic carbon fiber or FRP antennas and semi-automatic manual motorized antennas. Media channels and broadcasters use uplink and downlink services. Satcom Media provides solutions for this part of broadcasting business include solutions around Teleport, DSNG, and RF solutions. The expert team of professionals of Satcom Media Broadcast Pvt. Ltd. – The company offers effective solutions for uplink and downlink services. Quality of solution matters a lot here due to the criticality of this part of the broadcasting industry. Especially for the live programs, shows, and news channels, an uninterrupted solution is required. Satcom Media offers cutting edge solutions to media houses, news channels and broadcasters to offer constant services with the best viewing experience. Satcom Media Provide such services in an efficient and professional way. We also offer next-generation Newsgathering solution/s which uses 3G/4G platform/codec to broadcast news/media content to Central TV station without any Traditional DSNG VAN. 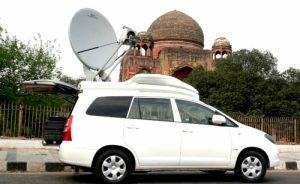 Digital satellite news gathering (DSNG) is a system that combines electronic news gathering (ENG) with satellite news gathering (SNG). The first types of ENG systems were extensively used during the dispute over the Falkland Islands between England and Argentina in 1982. As time passed and electronic devices become smaller, a whole DSNG system was fitted into a van. DSNG vans are now common; they’re extensively used in covering news events. The DSNG van, also known as an “outside broadcast” (OB) van, is a mobile communications system using state-of-the-art equipment to produce and transmit news as it happens, where it happens. A typical DSNG van is outfitted with a two-way high-power amplifier, satellite system, a production component, and an energy framework. The DSNG van also comes with a custom and the powerful electrical system, as it needs to power all the equipment it carries without the need for any external source. There are also several additional types of equipment inside the van: a traveling wave tube amplifier (TWTA) OR Solid State Power Amplifier (SSPA), an encoder/modulator, audio amplifier, video amplifier, P2 player and downlink system with step by step monitoring. Satcom Media provides fixed satellite terminals for news gathering on 1.8 M antenna/2.4 M antenna. The solution is available both on DVB/DVBS2 Encoder with a modulator.